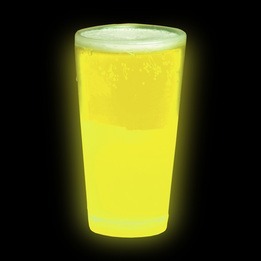 Brighten up child celebrations, special events, night beach parties with this yellow 12 oz GLOW cup. This disposable cup is white prior to the glow and can hold a 12 oz beverage of your choice. To activate the glow the glass must be cracked where indicated and then shaken. Once activated the light durability is more than 6 hours. This glow and festive accessory is not recommended for children under the age of 5 years old.